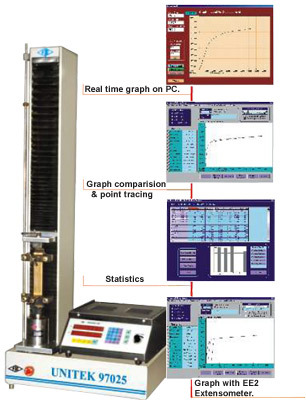 FIE Universal Testing Series Unitek 9700 are microprocessor based Electromechanical machines with Servo drive designed for testing & Studying mechanical behavior of various materials like metals, polymers Etc. These machines offer good built-in features to offer excellent stand alone performance for standard tests & great flexibility for complex analysis. These machines confirm to IS, BS & ASTM standards. Precision DC Servo motor & drive with ball lead screw gives an advanced drive system with 1 to 1000 standard speed range. Computerised Microprocessor based instrumentation to measure display & store load & displacement value. Provision for load cell interchangeability & thereby automatic selection of load full scale. Speed selection through Data entry or variable speed selector through potentiometer. Facility for mounting different load cells & clamping devices to suit different tests & materials such as thin wires, metalsheets, fiberglass, leathers, springs, cardboards etc. Built-in parallel interface to connect printer for data & curve print-out. Safety interlock for overload & limit switch sensing to ensure protection during test. Universal applications in R & D, education, quality control & production for test like tensile, compression, bending etc. Data entry with numeric keyboard of test parameters including speeds, rupture % peak, preload, modulus data , test data & specimen data etc. 20input data set storage, 50 results storage, maintains data & results during power off. Batch test facility for generating batch & statistics result using same data set. optional remote to ease specimen loading/unloading. FIE offers a wide range of optional accessories along with unitek 9700 Machines to cover almost every material test requirement. 100N, 250N, 1kN, 2.5kN. Load cells of different capacity can be offered as per customers requirements. Electronic analog extensometers are offered along with interface card on the control panel to measure with a resolution of 1 micron. The Universal 2001 series control panel can be hooked to any PC using RS-232 communication port. FIE offers different windows based software packages with real time graph on PC to enable the user to effectively evaluate different parameters. Extensive graphics on screen for curve plotting, magnification and zooming. Software features includes Graph comparison, point tracing facility. Different units selection for load & displacement. Statistical evaluation with water fall dig., Mean deviation, frequency distribution, Skew dig., Historigram. Also calculates max. value, min. value, mean value, Variance, Standard Deviation. (Other statistical parameters on request). Selectable batch & statistical printouts. Evaluation of wide range of user selectable parameters such as % elongation, % reduction in area, young's modulus, yield stress, proof stress etc. Software packages for Shear, Bend, Torsion, Rubber, Textile etc. 0 - 40% of F.S. 1 / 20000 of nominal load cell connected. 0 - 100% of F.S. 1 / 10000 of nominal load cell connected. 40 - 100% of F.S. 1 / 4000 of nominal load cell connected. ±1% from 2% to 100% of nominal load of loadcell used. Due to constant R & D Specifications & Features are subject to change without notice.